Eva Bubat followed acting lessons in Heidelberg. She married and divorced and had a little daughter when she was engaged at the Schillertheater in Berlin after the second world war. Elisabeth Flickenschildt was the star at the time and she lost most important parts to her and Bertha Drews. In the 1960s she played small parts on television. At the time of her death in 2002 not a single program of photograph in her house reminded of her time at the theatre. 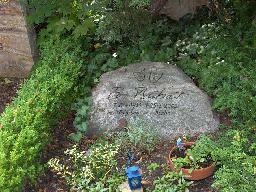 The grave of Eva Bubat at the Landeseigener Friedhof Dahlem, Berlin.